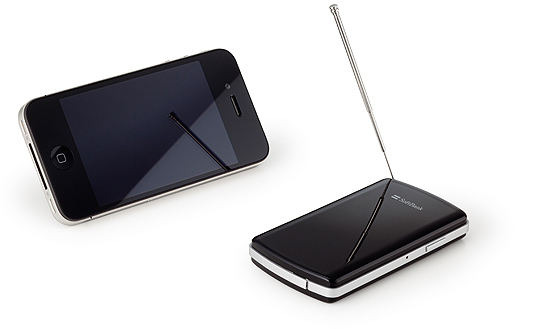 Softbank BB, Inc. announced it will sell iPhone/iPad and an Android loading terminal by wireless “TV tuner for iPhone/iPad / smart phone” in which viewing and listening and recording of one-segment broadcasting are possible. Sale is started by SoftBank SELECTION agency *2 and an online shop on Fri., September 30, 2011. 1. It is One-segment Broadcasting Viewing and Listening Comfortably by Wireless Connection. It is necessary to connect neither a cable nor a connector to a terminal, and you can use on various scenes, such as inside of the train of commuting and attending school, for the wireless connection by wireless communications (Wi-Fi). 2. Recording is Also Easy at Exclusive Application. You install the exclusive free application “TV tuner”, and can enjoy viewing and listening and recording in the easy operation which chooses a program from a channel list. 3. It is Stable Reception by Rod Antenna Loading. An elastic storing-type rod antenna is carried in this product upper part.The angle of an antenna can be moved freely and one-segment broadcasting viewing and listening can be enjoyed in search of a highly sensitive reception point. They are the compact size of about 12 mm of thinness, and the simple and stylish design which made black the keynote.